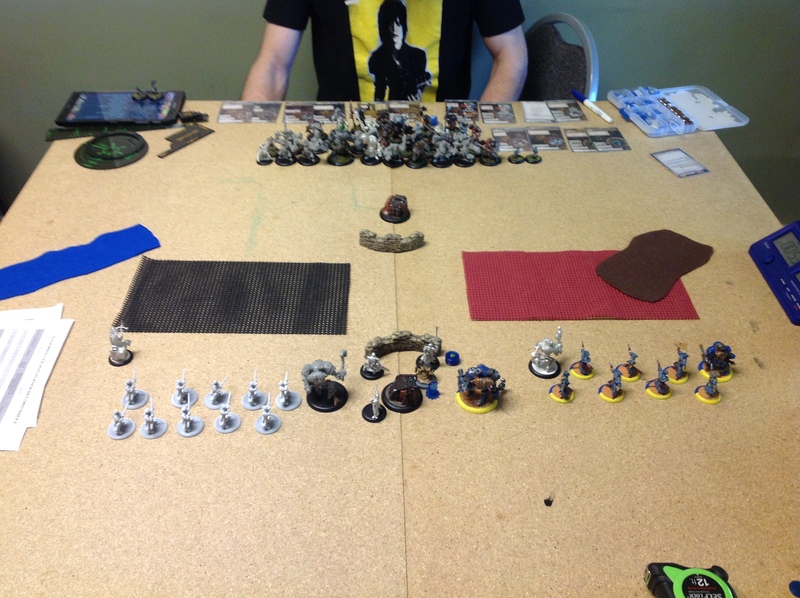 My second round opponent was Erik. His Trollbloods were lead by Hoarluk Doomshaper, Shaman of the Gnarls (Doomy1) and Grissel Bloodsong, Fell Caller (Grissel1). The scenario was incoming. Erik chooses Grissel and I picked Sloan. No ADR switch out. 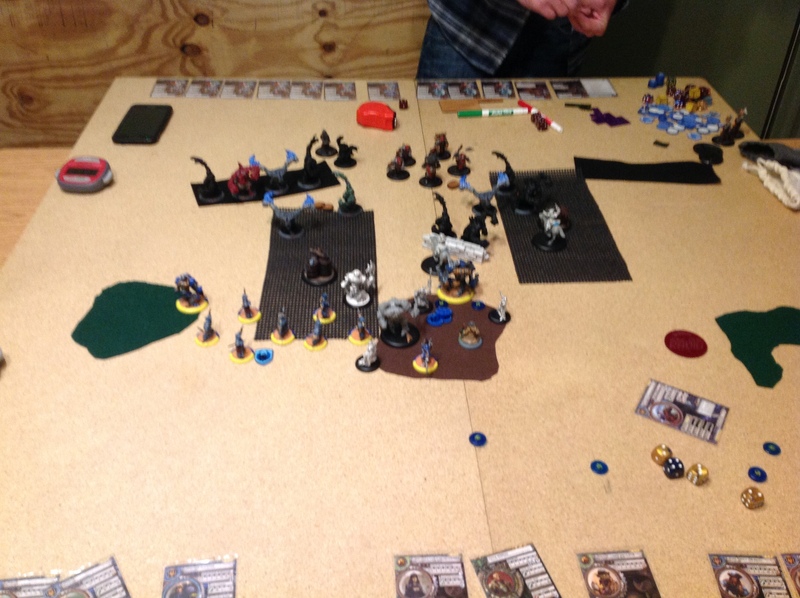 Turn one, I had everyone run forward including Sloan to get her to the convenient wall. 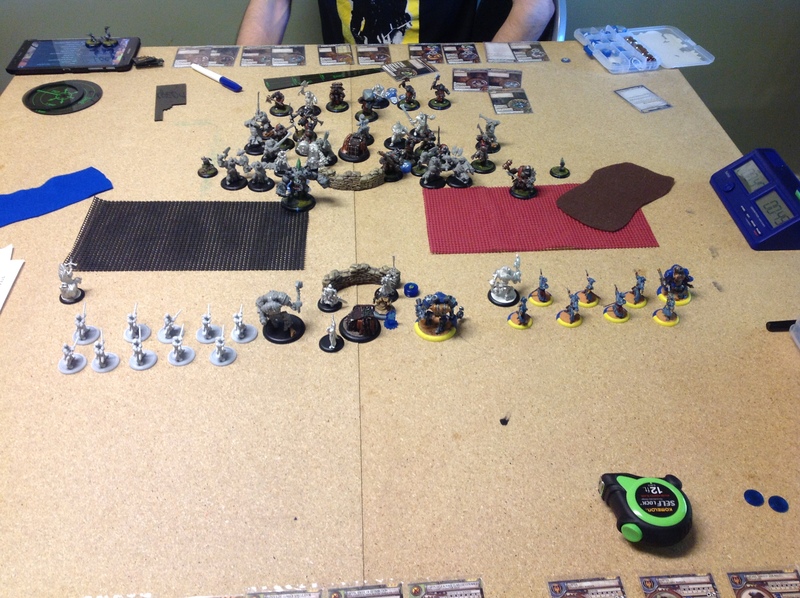 Erik runs the Mauler and Axer up. His champions and fennblades run to fill in the area around his wall. His Totem Hunter hides among the medium bases. 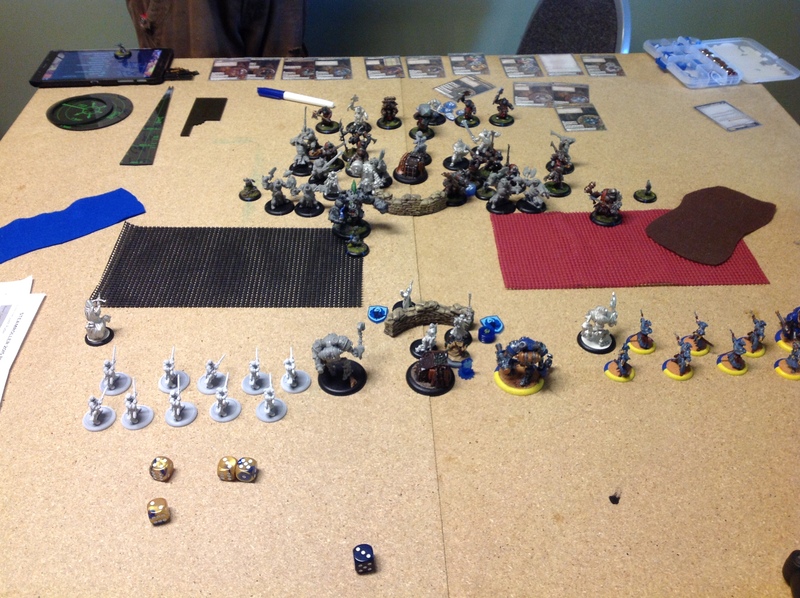 As Erik moves his models, I begin to think how many trolls I’ll need to kill so I’m not swarmed next turn. The champions and the beasts will probably take all my fire but I should be able to feat and kill most of them. Then Erik does something unexpected. 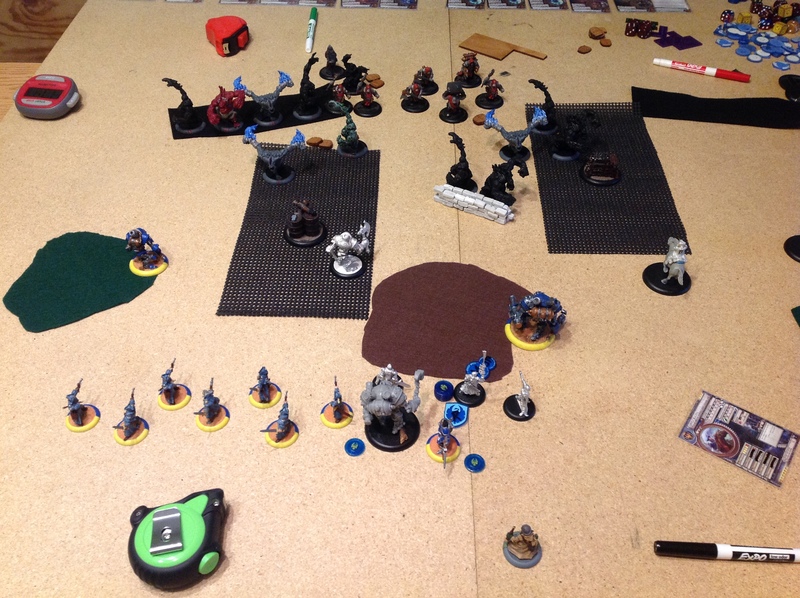 Grissel drops all her fury into the stone and advances to the objective. The stone advances behind Grissel. Turn two. I measure control. Grissel is about an inch outside of control. Clear line of sight to Sloan. I give one to each Defender. Reinholdt reloads Sloan. Pendrake give Taryn beast lore. Taryn makes the Axer disappear. Sloan aims, feats, and shoots Grissel twice. She fails to tough. 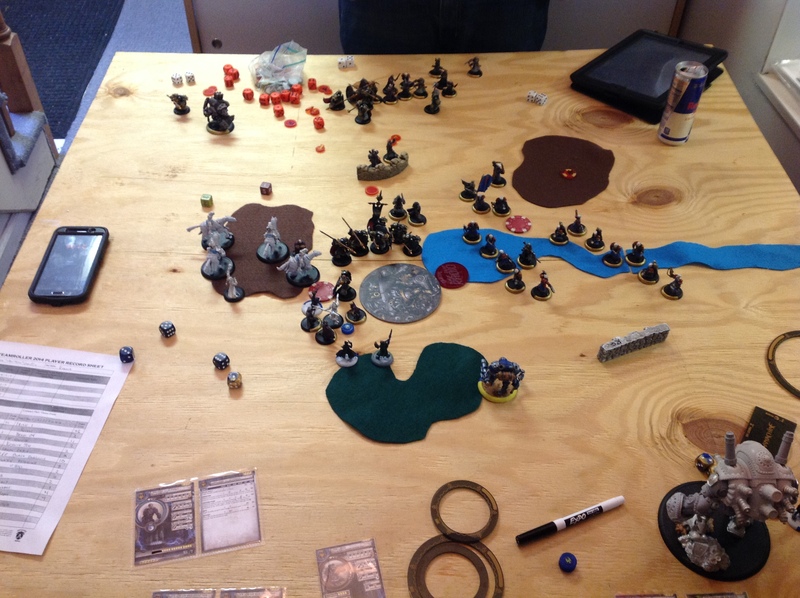 Erik and I talked afterwards and I found out he was a relatively new player to warmahordes. We talked about his list and what he could have done to keep Sloan from shooting Grissel off the table by blocking light of sight and keeping a few fury for transfers. After doing a little looking up on Grissel, it would have been a much different game if the Fennblade had been in front and Grissel had use Hoof It on them first turn. 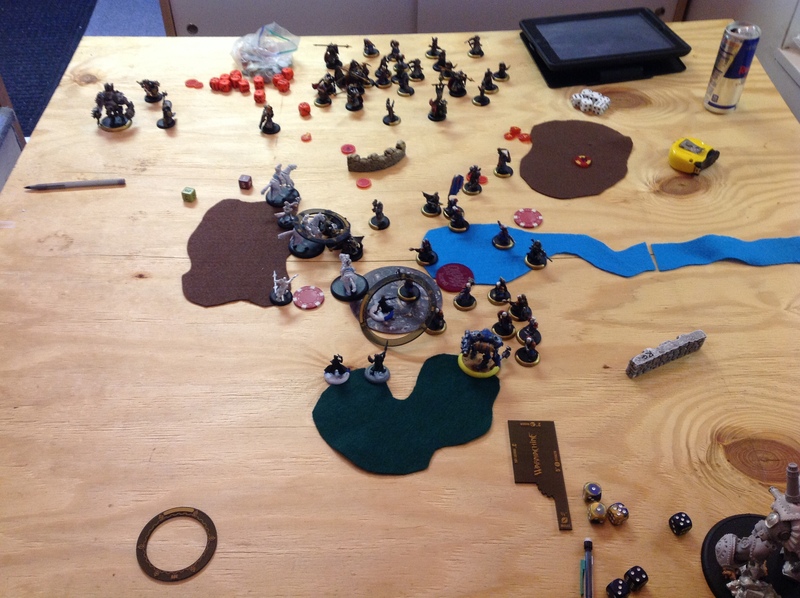 With the fennblades 28 inches up the board and LoS to the caster blocked. 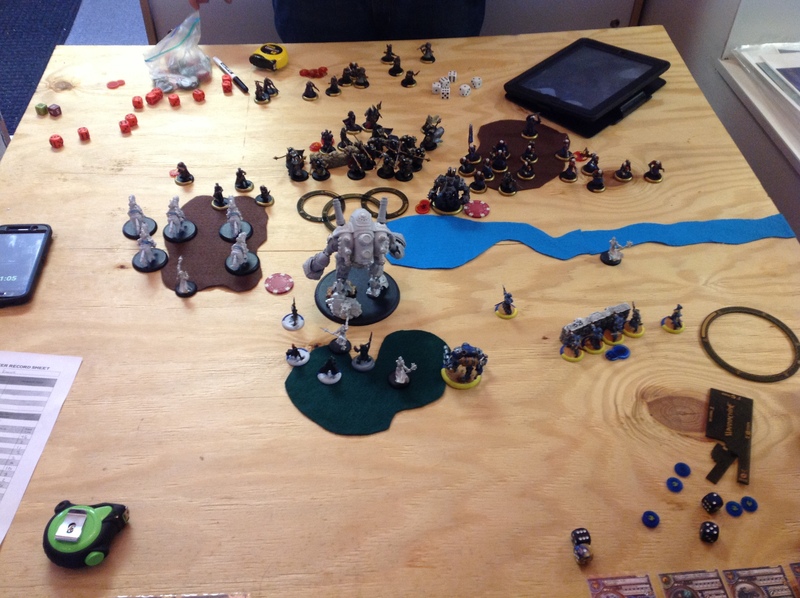 He could have pinned me on the other side of the zones and won on scenario. I’d been waiting for this match up. 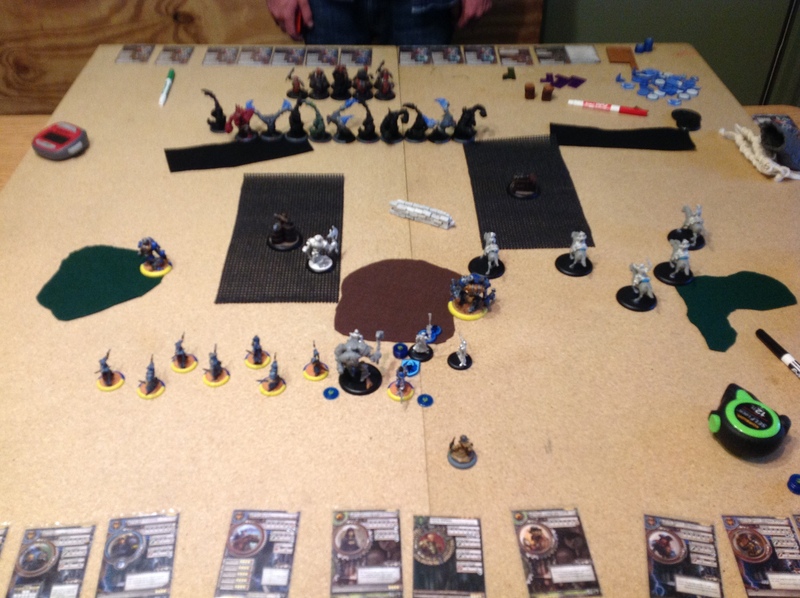 Mike and I had great game at the Geek Out Game Qualifier with Sloan verses Doomy’s Runes of War. I won that battle with a long shot from Junior. We didn’t get to play a rematch at the Planet Comics Qualifier but now is the chance for that rematch. 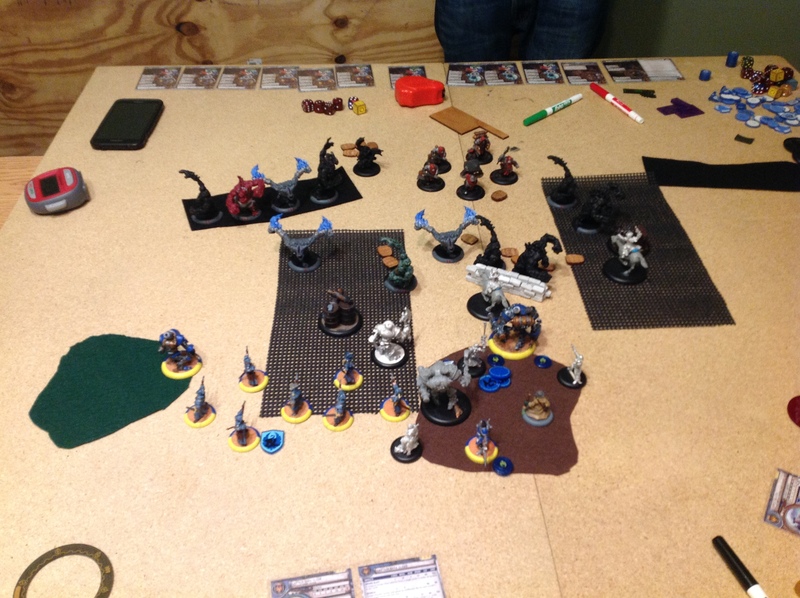 Mike’s forces are lead by Hoarluk Doomshaper, Shaman of the Gnarls (Doomy1) and his Runes of War and Calandra Truthsayer, Oracle of the Glimmerwood and her Evolutionary Elementalism. The scenario is two fronts. Mike chooses Calandra and I choose Sloan. I swap my long gunners and Eiryss for Tempest Blazers and Junior. Turn one. I think I can get a few pot shots with Sloan and the Defenders. I was wrong. So the battle group and support get a bit in each others way. The blazers advance and try and spread out. The hunters take shots at the slag trolls doing okay damage. 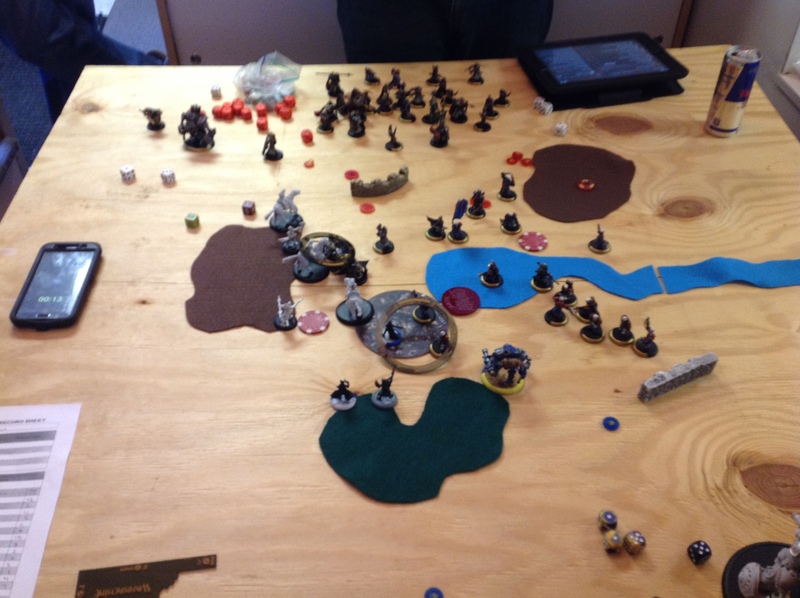 Gun mages advance. Junior cast Arcane Shield on Sloan. Mike’s beasts advance. A slag troll hits a hunter. A storm troll murders three blazers. A pyre troll throws at the other hunter and misses. The rest of the beasts either run to behind the wall or into the trench. 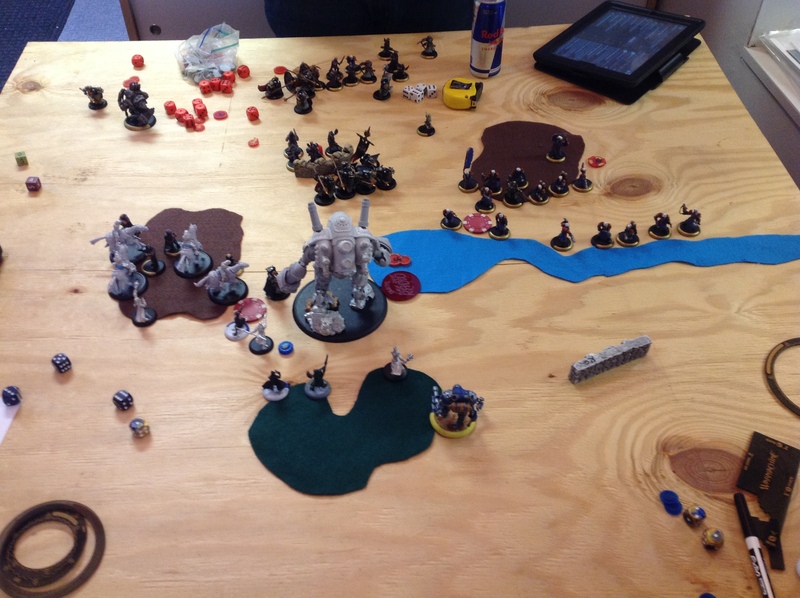 Calandra used two fury to re-roll some beast attacks. She moves closer, casts Soothing Song, and puts two in the stone. The stone pop aura and run to block line of sight. 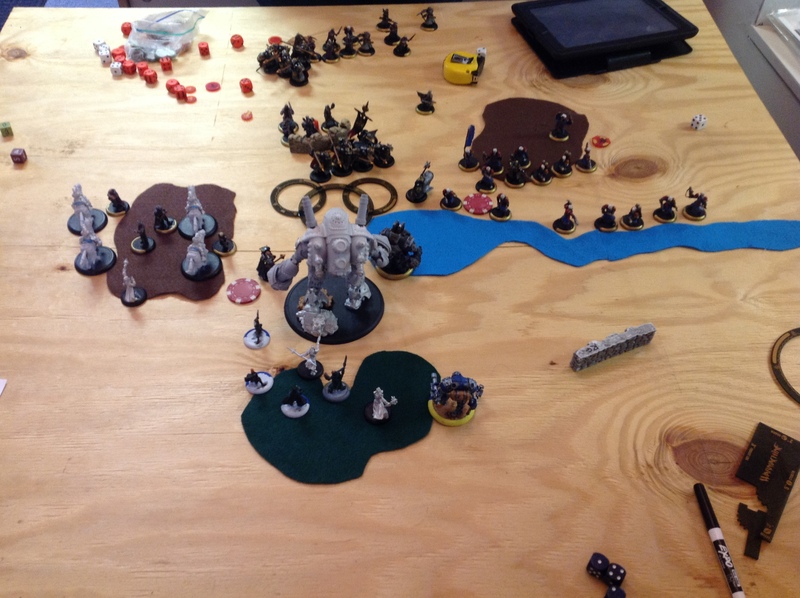 On turn two, I get so focused on the assassination potential. I give one to each Defender. Upkeep Arcane Shield. The hunters go and shoot the two stone bearers off the board. (mistake 1). Pendrake gives the gun mages beast lore. The guns move and crit brute into the pyre and slag troll. (mistake 2). 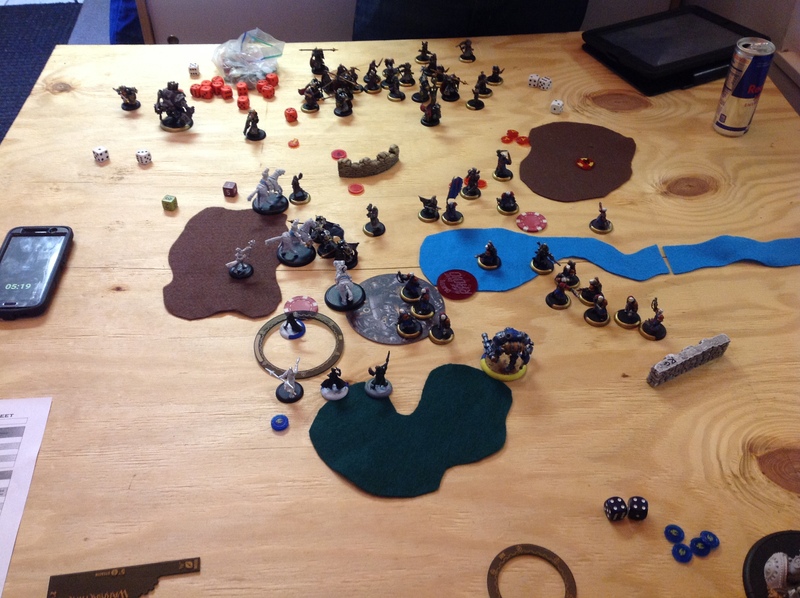 Sloan advances cast Fire Group, feats, and fires… once into Calandra. She transfers. I had forgotten to activate Reinholdt so no second shot. (mistake 3) The Painted Defender bonus shot is just out of range. 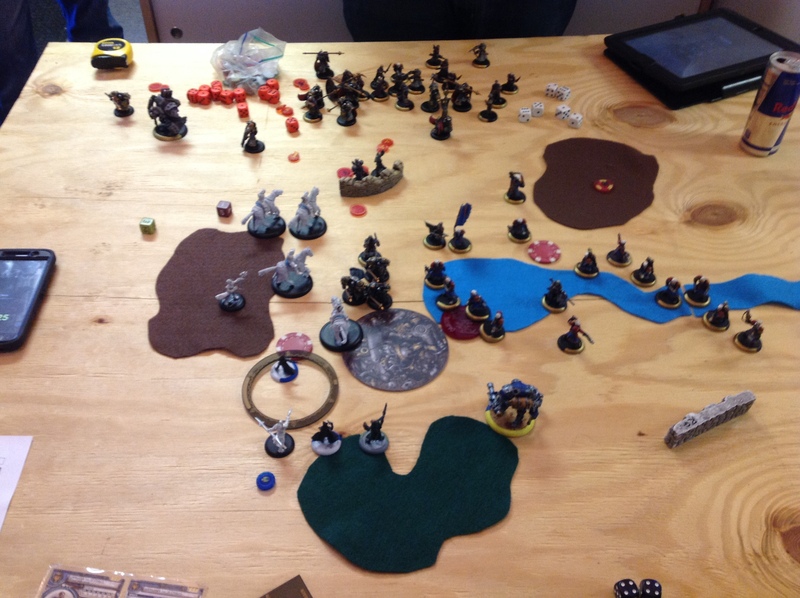 Naked Defender activates, advances, and fires into Calandra. She transfers. Bonus shot from Sloan. Minor damage. 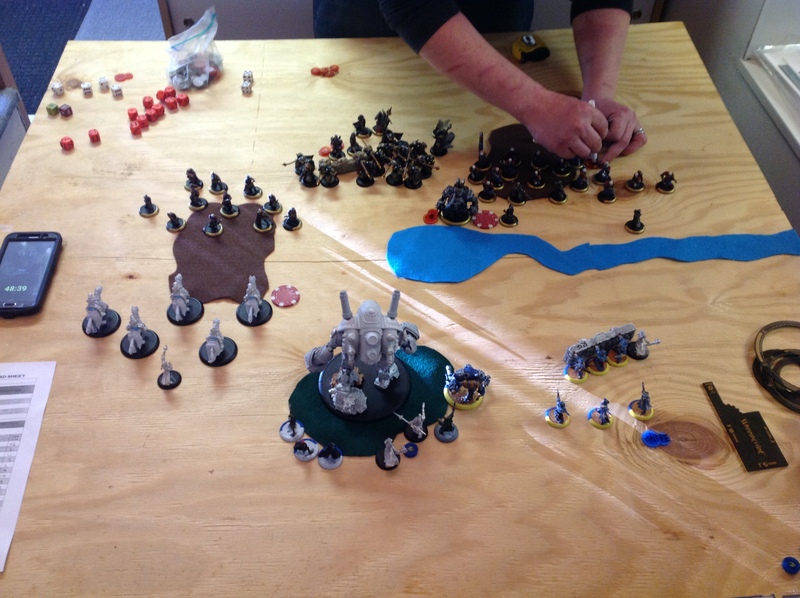 Painted Defender activates, advances, and fires. Low damage. Naked Defender bonus shot. Minor damage. Calandra is now at seven boxes left and I only have Junior, Taryn, and two Blazers left. They can’t get in range. Mike cuts for three. Calandra feats. Storm troll aims and shoots at Sloan, hit, some damage. Slag troll does the same. More damage. Pyre troll moves up fires at Sloan. More damage. Slag troll moves up fires and kills Sloan on the hill. I made a few mistakes in this game. Reinholdt could have been the difference but I should have saved the hunters for Calandra and used the Gun mages to kill the Stone bearers instead. Also thinking about it, the long gunners would have been a better choice for dealing with the warbeast if I hadn’t of had the assassination target. Mike could have made the assassination nearly impossible if bullet dodger was up or a couple beasts were blocking line of sight. It was a good game but I played rushed and forgot activation I don’t normally miss. I still think the last two theme benefits of EE should be swapped. Advance deployed one-point cheaper light warbeast are silly. That is more a comment on Privateer Press then on the game. Missed round 1? Check it out!